Quality of life (QoL) is defined as the "individuals' perceptions of their position in life in the context of the culture and value systems in which they live and in relation to their goals, expectations, standards and concerns." , Hence, QoL denotes subjective contexts of physical, psychological, cultural, social, and environmental perceptions from a holistic perspective. World Health Organization Quality of Life-BREF (WHOQOL-BREF) is a validated and widely used instrument for determining the impact of several diseases on QoL. A limited number of studies carried out in India have studied QoL, however, none of these have assessed its association with job stress among professionals working in Information Technology (IT) and Information Technology Enabled Services (ITES). , In common parlance, QoL is perceived as having better access to amenities and services. Based on contextual settings, the perceived meaning of QoL and the means of attaining a higher level of QoL may vary. In the process of attempting to achieve perceived higher levels of QoL, individuals may be willing to endure/tolerate greater levels of stress. "Job stressors" are defined as "working conditions that may lead to acute reactions, or strains in the worker." It is plausible that professionals can subject themselves to greater degrees of stress in their occupational settings in order to achieve better QoL. There have been no attempts in India, thus far, to explore the psychosocial determinants (such as the amount of job stress one is willing to endure) of attaining a higher level of QoL. This study aims to explore the domains of job stress among IT/ITES professionals and estimate their associations with attainment of higher/positive levels of QoL, accounting for other potential determinants of job stress and QoL. We recruited 1071 IT/ITES professionals for the current study from the IT and ITES sectors. A detailed description of study methods including sample size and method of recruitment have been reported elsewhere. In brief, we included workers from the IT and ITES industry who were 20-59 years old and had been working for at least 1 year prior to inclusion in the study. After obtaining informed consent, participants were requested to complete a self-administered questionnaire that contained items on QoL and job stressors. The original version of the QoL instrument, developed by the WHO, WHOQOL-100, allows a thorough evaluation of individual facets related to QoL. The WHOQOL-BREF is the shorter version of the same tool that examines domain level profiles. The WHOQOL-BREF contains 26 questions in total, consisting of one item from each of the 24 facets present in the WHOQOL-100, along with one item to assess the overall QoL and another to examine health in general. 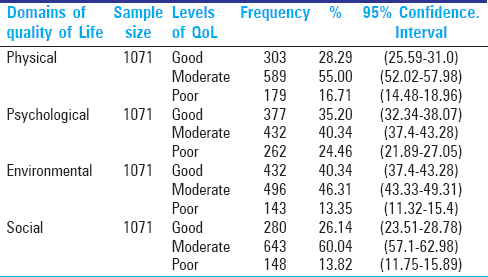 The WHOQOL-BREF estimates the overall QoL through four domain scores. The four domain scores denote an individual's perception about his/her QoL in each particular domain, with higher scores denoting better QoL. The mean score of items within each domain denotes the score for that particular domain. The scores are multiplied by 4 to rescale the domain scores to the level of WHOQOL-100. For the current study, we calculated the QoL scores using an SPSS syntax file, obtained from the WHOQOL SRPB Coordinator, Mental Health: Evidence and Research, Department of Mental Health and Substance Dependence, CH-1211 Geneva 27, Switzerland. The WHO-QoL,  a generic measure of health-related quality of life (HRQoL) was used to assess and classify health status of workers according to job titles held by them. To estimate job stress we utilized stress domains identified from a preceding qualitative study. The stress domains included time pressure, length of experience, shift, income, job control, autonomy, appreciation, physical environment, work environment, and emotional stressors. Variables were recoded in increasing order of contextual stress and increasing levels of QoL. Newly coded variables were created in the dataset for further analysis. The data from the cross-sectional survey was analyzed using SAS 9.1.3104. Detailed analysis plan has been described elsewhere. , In brief, we employed ordinal logistic regression for testing associations between the QoL domains and job stressors. For this purpose, tertiles of stress domain scores (Y) were used as ordinal categories - namely low, moderate, and high levels of stress. We did not use polytomous logistic regression because such an analysis plan would not make use of the information about ordering of variable categories, and hence, would be comparatively inefficient. On the other hand, ordinal logistic regression model, using cumulative probabilities, takes into account the ordering obtained from contextual stress domains. The cumulative ordinal logistic model for outcome having ordinal categories can be employed when the coefficients of the predictor variables do not depend on i, and it can be assumed that there is one common parameter βij for each covariate. Based on above assumption, an example of cumulative odds model will be [Supplement equation] [Additional file 1] . This model suggests that the k odds for each cut-off category i will differ only with regard to the intercepts ai. The details of variable selection and data completeness are provided in our earlier paper. In brief, data from 1071 participants were included for analyses on the variables of interest. Based on WHO-QoL, out of 1071 participants, 55% were found to have moderate quality of physical life. In the psychological domain of QoL, nearly 40% belonged to the moderate category, whereas 35% were classified as having poor QoL. Regarding quality of environmental life, 46% and 40% of the participants had moderate and poor QoL, respectively. 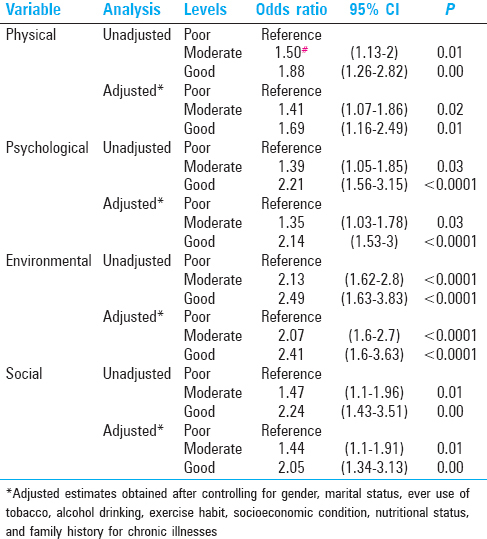 Sixty percent of the participants fell into category of moderate quality of social life [Table 1]. Being in the "good" category for physical and psychological QoL was found to be significantly associated with presence of higher occupational stress related to autonomy in both unadjusted and adjusted models. In addition, participants with moderate and good quality of environmental life were more likely to have higher autonomy related stress - both before and after adjustment of confounders. Having moderate and good social QoL was found to be associated with higher autonomy-related job stress in the unadjusted analysis; however, in the adjusted model, only good category of social QoL showed significant positive association with higher autonomy related job stress [Table 2]. 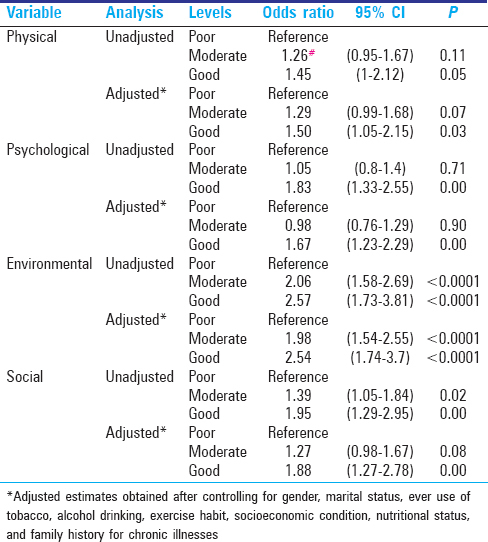 In comparison to workers reporting poor QoL, workers having moderate and good physical, psychological, environmental, and social QoL were found to have significantly higher odds of occupational stress related to physical environment in both unadjusted and adjusted models [Table 3]. 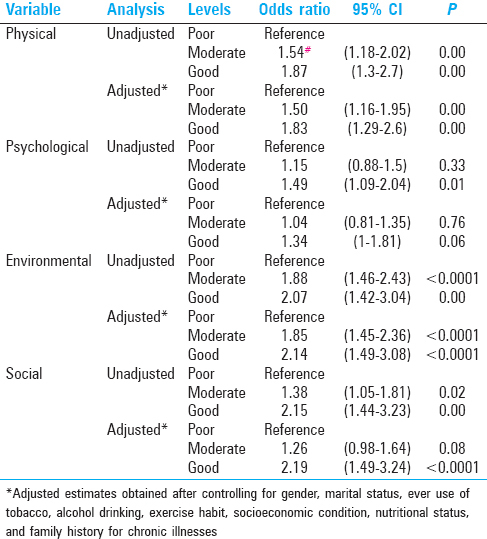 Similarly, in both unadjusted and adjusted analyses, except for the moderate category of psychological QoL, participants belonging to moderate and good category, compared to those from poor category, in all four domains of QoL had significantly higher odds of occupational stress related to work environment [Table 4]. [Table 5] depicts the results of crude and adjusted analyses of associations between QoL and occupational stress related to emotion. In comparison to workers having poor QoL, those with moderate and good score in any of the four QoL domains were found to have higher odds of occupational stress related to emotion in both unadjusted and adjusted models. The results of the present study indicate a significant positive association between QoL and increasing stress in the domains of autonomy, physical infrastructure, work environment, and emotional factors. All the QoL domains (physical, psychological, social, and environmental) showed statistically significant positive associations with increasing stress in the domains of autonomy, physical infrastructure, work environment, and emotional factors. First, many researchers have suggested the presence of an inverse relationship between QoL and stress. In particular, "Yerkes-Dodson law" states that "As the difficultness of discrimination is increased the strength of that stimulus which is most favorable to habit formation approaches the threshold." ,,,,,, Interpretation of this law suggests that there is an inverted U-shaped relationship between QoL achieved through efficiency of coping and arousal due to stress. ,,, Deducing from this logic, the peak accomplishment of QoL probably occurs by stimulus of moderate-to-high levels of job stressors, which facilitate transformation. ,,, Further, very low levels of job stress might lead to mix-up of extraneous and pertinent cues, leading to very little or no change toward better QoL. The term "eustress" or good stress was coined by Hans Selye. "Eustress" or good stress,  concept suggests that there may be some common benefits accrued due to stress until it reaches a certain level. Beyond such cut-off, stress is likely to have negative effects, turning into "distress." Second, it is a possibility that workers experiencing highest levels of stress had to drop out of the study, probably even leave their jobs, and the ensuing survivor bias might have affected the results. In such a scenario, those who could handle stress well continued to work, got promoted in their jobs, and possibly reported higher levels of QoL. Further, stress (eustress of distress) may not be a simple consequence of exposure to stressors alone because varying perception of stressors by different individuals plays an important role in this phenomena. ,, Stress appraisal models by Folkman and Lazarus can be more apt in this context as an explanation for the observations. , These models offer a view based on the perception, coping, and interpersonal attitudes. The current study had some major strengths. A large sample size allowed us to capture the experiences of participants from different background and to adjust for several confounders simultaneously. Moreover, use of a standardized instrument for assessing occupational stress and QoL improves validity and permits external comparison of study findings. Nonetheless, few important limitations affected this study. Because of the cross-sectional nature of data collection, it is not possible to rule out temporal ambiguity and as a result observed positive associations cannot be interpreted as causal. Moreover, we did not measure coping mechanisms such as sense of coherence and personality characteristics, which could be potential mediators in the pathway between stress and QoL. As with any observational study, we cannot rule out the presence of selection bias and confounding as well as their possible role in the reported association. Notwithstanding the limitations, our research provides an important insight into a relatively less explored area of occupational epidemiology. Job stress is reportedly associated with higher income, higher control job categories that also pay better. The respondents in this study seemed to find the trade-off of higher stress to be acceptable in lieu of corresponding improvement in their QoL. It is also possible that "eustress" might actually be responsible for betterment in QoL - either directly or through mediation of variables such as personal values and aspirations, personality characteristics, income, and others. Large-scale future studies, preferably prospective in design, can be helpful in providing conclusive evidences in this regard. Group W. Development of the WHOQOL: Rationale and current status. Int J Mental Health 1994;23:24-56. Group W. The development of the World Health Organization quality of life assessment instrument (the WHOQOL). Quality of life assessment: International perspectives Heidelberg: Springer Verlag; 1994. p. 41-60. Jha A, Sadhukhan SK, Velusamy S, Banerjee G, Banerjee A, Saha A, et al. Exploring the quality of life (QOL) in the Indian software industry: A public health viewpoint. Int J Public Health 2012;57:371-81. Kesavachandran C, Rastogi S, Das M, Khan AM. Working conditions and health among employees at information technology-enabled services: A review of current evidence. Indian J Med Sci 2006;60:300. Babu GR, Mahapatra T, Detels R. Application of mixed methods for exploration of the association of job stress and hypertension among software professionals in Bengaluru, India. Indian J Occup Environ Med 2013;17:41. (WHO) WHO. WHOQOL: Measuring quality of life. Division of Mental Health and Prevention of Substance Abuse, World Health Organization; 1997. Giridhara R Babu RD. Chapter. 3. A Qualitative study about work-environment of software professional in Bengaluru, India [Papers]. Los Angeles: University of California Los Angeles; 2012. Borle A, Gunjal S, Jadhao A, Ughade S, Humne A. Musculoskeletal morbidities among bus drivers in city of Central India. Age 2012;46:28-57. Giridhara R Babu RD. Chapter. 2. Methods of IT/ITES study in Bengaluru, India [Papers]. Los Angeles: University of California Los Angeles; 2012. Institute S. SAS software: Version 9.1. SAS Institute Cary, NC; 2002. McCullagh P. Regression models for ordinal data. J Royal Stat Soc B 1980:109-42. Babu GR, Mahapatra T, Detels R. Job stress and hypertension in younger software professionals in India. Indian J Occup Environ Med 2013;17:101. Commissaris D, Douwes M, Schoenmaker N, de Korte E, editors. Recommendations for sufficient physical activity at work 2007. Work EAfSaHa. Health and safety at work in Europe (1999-2007): A statistical portrait. Luxembourg: European Union; 2010. Bhattacharya S, Basu J. Distress, wellness and organizational role stress among IT professionals: Role of life events and coping resources. J Indian Acad Appl Psychol 2007;33:169-78. Chaturvedi S, Kalyanasundaram S, Jagadish A, Prabhu V, Narasimha V. Detection of stress, anxiety and depression in IT/ITES professionals in the Silicon Valley of India: A preliminary study. Primary Care Community Psychiatry 2007;12:75-80. Albrecht GL, Devlieger PJ. The disability paradox: High quality of life against all odds. Soc Sci Med 1999;48:977-88. Broadhurst P. The interaction of task difficulty and motivation: The Yerkes-Dodson law revived. Acta Psychol 1959;16:321-38. Winton WM. Do introductory textbooks present the Yerkes-Dodson Law correctly? American Psychologist; Am Psychol 1987;42:202. Broadbent DE. A REFORMULATION OF THE YERKES-DODSON LAW. Br J Math Stat Psychol 1965;18:145-57. Selye H. On the real benefits of eustress. Psychol Today 1978;11:60-70. Fevre ML, Matheny J, Kolt GS. Eustress, distress, and interpretation in occupational stress. J Managerial Psychol 2003;18:726-44. Selye H. Confusion and controversy in the stress field. J Human Stress 1975;1:37-44. Selye H. Selye′s guide to stress research: Van Nostrand Reinhold Company; 1983. Folkman S, Lazarus RS, Dunkel-Schetter C, DeLongis A, Gruen RJ. Dynamics of a stressful encounter: Cognitive appraisal, coping, and encounter outcomes. J Person Soc Psychol 1986;50:992. Folkman S, Lazarus RS. If it changes it must be a process: Study of emotion and coping during three stages of a college examination. J Person Soc Psychol 1985;48:150. Kanwar YPS, Singh AK, Kodwani AD. Work-Life Balance and Burnout as Predictors of Job Satisfaction in the IT-ITES Industry. Vision 2009;13:1-12. Carlson DS, Perrewé PL. The role of social support in the stressor-strain relationship: An examination of work-family conflict. J Management 1999;25:513-40. Bedeian AG, Burke BG, Moffett RG. 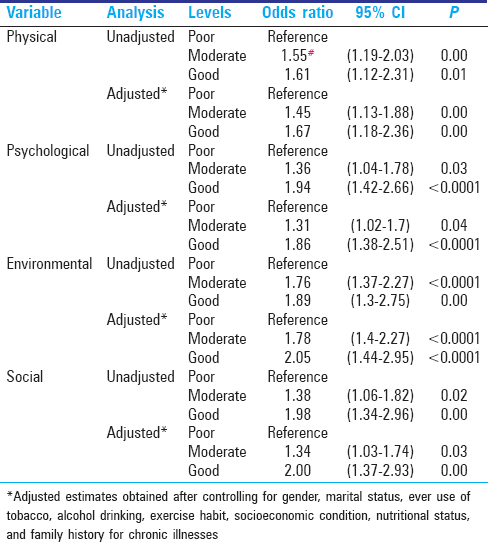 Outcomes of work-family conflict among married male and female professionals. J Management 1988;14:475-91.